The Walking Dead Recap: Season 3, Episode 2 reviews. 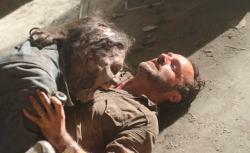 Zombie mono, Rick’s cynicism, and zombie C-sections. In the Season 2 finale, Rick finally revealed to his group what the CDC researcher whispered into his ear: Everyone has the zombie virus, and anyone who dies with an intact brain rises once more as a walker. Ever since, I’ve been wondering if getting bit by a zombie actually matters anymore. Aren’t bites supposed to turn you into a zombie by infecting you with the zombie virus? So what does it matter if you get infected with a virus you already have? Slate commenter Lemur_Lad seems to have figured out the rules on this one: “A bite from an active zombie that gets in your bloodstream will make you sick and eventually kill you, only to resurrect as a Walker. Otherwise the infection everyone carries waits until natural death to activate.” I suppose there is some other biological agent, apart from the zombie virus, that’s transferred via zombie saliva, sickens you, and kills you, thereby zombifying you. I’ll just embrace this “Zombie Mono” explanation and press on. Rick’s new cynicism is understandable. He and his group live in a perpetual bloodbath. This season has really upped the gore, which prompted Zap2It to ask Mazzarra if he’s not making the show too gross. Stuff I’m having trouble scrubbing from my memory: Rick pulling the face off a zombie in the season premiere, Hershel’s severed leg lying nonchalantly on the floor, and, of course, the zombie C-section in “Sick.” The Baltimore Sun’s Andrew Conrad called that scene “the most lasting image” of the episode. If, amid all this gore, Rick ever found relief in his family, he doesn’t anymore. After Lori resuscitates Hershel, Rick and Lori meet outside and joke about the frivolousness of a divorce in a zombie apocalypse. But their marriage is clearly over. As Caitlin Hughes from Film School Rejects writes, when Rick puts his hand on Lori’s shoulder and says, “We’re awful grateful for what you did” as if she’s any other member of the group, Rick is basically signing their divorce papers. It’s good that Carl’s learned to hold his own, because both parents are neglecting him, and I expect their separation will only make his life worse. If not for the characters, then for the audience: So far so good! The Walking Dead has, for the most part, avoided the mistakes of its previous season. I’ll agree with Maureen Ryan from the Huffington Post: This is shaping up to be the best season yet.